Sciblogs | To Dunedin! On an ivory quest! To Dunedin! On an ivory quest! But on Friday, I will be at Otago University and giving a seminar on ivory black markets. One topic I’m going to highlight is whether the legal factories in China (all 37 of them) are a significant source of illegal carvings. The production problem is usually glibly ignored or assumed away. But essentially, if you do think that it is the demand for carvings in East Asia (and mostly China) that drives the poaching, there is a production challenge. 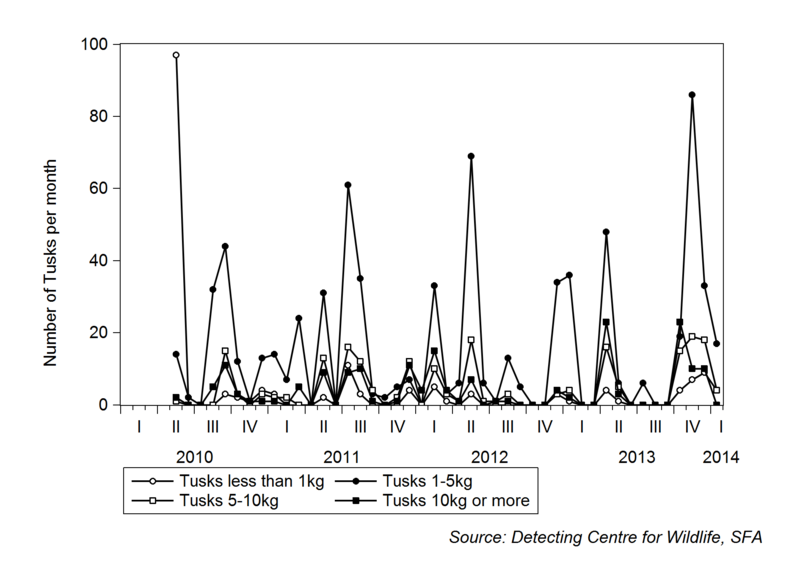 The 37 legal factories in China go through around 23-23 tusks per month (Figure 1). If we accept that 25,000 elephants a year are being poached for ivory, and this is fed rapidly into the market for carvings, then that’s over 4000 tusks a month that has to be carved into carvings. If we go for some of the bigger estimates- 35,000 elephants a year- that means over 5800 tusks a month. A comparison with what the entire legal system in China is managing is sobering. That’s an enormous gap that has not yet been accounted for. I think once again, we have to take on board the hypothesis that most of the illegal ivory isn’t being exported to be churned out as carvings. It’s feeding a speculative market that is stockpiling raw ivory. And the drivers of that are not Chinese affluence. The drivers are the perceived scarcity of ivory combined with the uncertainty in its supply.